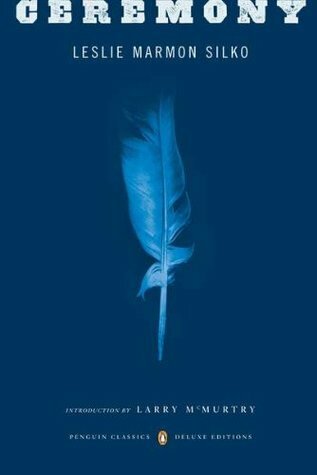 This week’s Five Star Friday recommendation is Ceremony by Leslie Marmon Silko, a must-read in modern American literature. I’ve read Ceremony many times now as well and each time I discover something new. The novel is fluid and easy to read while also full of detail and intricacy. It all begins in the Laguna Pueblo reservation in New Mexico. After witnessing a soldier kill his cousin, Rocky, World War II veteran, Tayo, returns home to his grandmother and aunt’s house on the Laguna Pueblo reservation only to be haunted by many things: the rainy waterlogged jungle he fought in compared to his drought-stricken reservation, the feeling of disparity between he and the white soldiers he fought alongside and the similarity he recognized in Japanese soldiers’ eyes, and the clash between modern reservation life and traditional culture and spirituality. Tayo knows his aunt wishes he’d died instead of her son, Rocky. At the same time, he must also cope with the death of his beloved uncle and the disappearance of the family’s cattle. Adding on another problem, a drought refuses to lift from his community, leaving failing crops and animals and a parched landscape. In order to heal both himself and the land, Tayo must begin a long ceremony that interweaves and connects his past, the war, and the Laguna Pueblo culture. Ceremony relies heavily on the senses. Tayo’s world is colorful and visceral, spliced with poetry illustrating Laguna stories from the Laguna Pueblo past. The novel is full of rich detail, creative language, and strong characters, both good-hearted, bad, but mostly a little in between. If you want to experience Ceremony, pick up a copy today. Yellow Woman and a Beauty of the Spirit is a collection of essays on modern Native American life. Silko discusses the cultural history of the Laguna Pueblo people in relationship to life today and her own autobiographical experiences, including the racism she faced, being a person of mixed ancestry. She also discusses immigration during the 1990’s and the many relationships between the U.S. government and many tribal nations, including the Pueblo. If you’re looking for a nonfiction read on Native American life or you want to further your knowledge of another culture, Yellow Woman and a Beauty of the Spirit is your book.